MORSEWAVE is the jWavelet module of jLab. 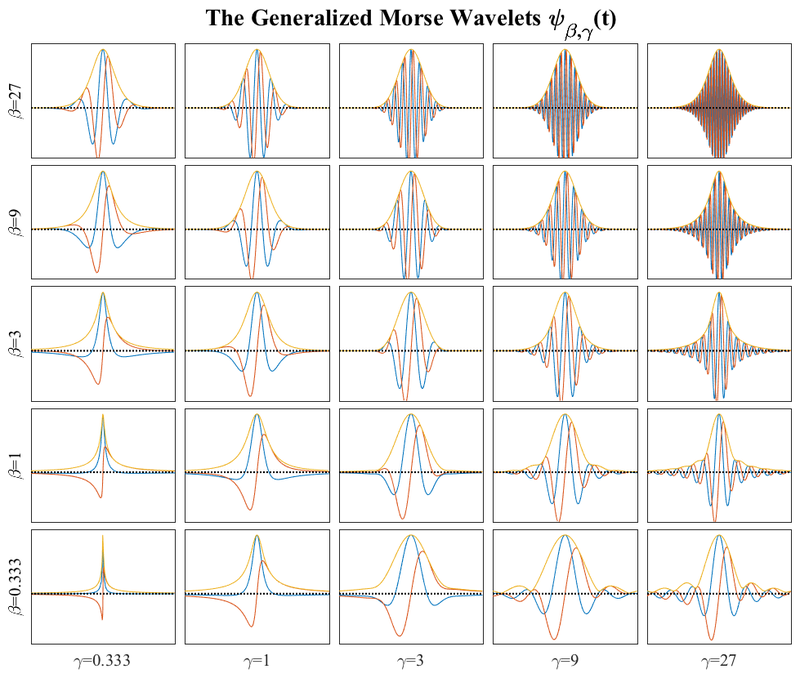 MORSEWAVE  Generalized Morse wavelets of Olhede and Walden (2002). specified by GAMMA and BETA, concentrated at frequencies FS. the Fourier transform of the wavelets reach their maximum amplitudes. series can be easily chosen using MORSESPACE. row number ROUND(SIZE(PSI,1)/2). FS assumes a unit sample rate. PSIF of the wavelets. PSIF is the same size as PSI. MORSEWAVE supports two kinds of normalization for the wavelets. the FFT of the wavelet has a peak value of 2 for all frequencies FS. domain wavelet energy SUM(ABS(PSI).^2,1) is then always unity. energy normalization corresponds to 1/SQRT(S). MORSEWAVE uses bandpass normalization by default. Morse wavelets, characterized by the order K.
versions of the first K orthogonal generalized Morse wavelets. multiwavelet polarization analysis, see Olhede and Walden (2003a,b). the peak value of the first frequency-domain wavelet equal to 2.
of analytic wavelets. IEEE Trans. Sig. Proc., 60 (11), 6036--6041.
wavelets. IEEE Trans. Sig. Proc., 57 (1), 146--160. Olhede and Walden (2002),  Generalized Morse Wavelets. IEEE Trans. Sig. Proc., 50 (11), 2661--2670. 'morsewave --t' runs a test. 'morsewave --f' generates some sample figures.